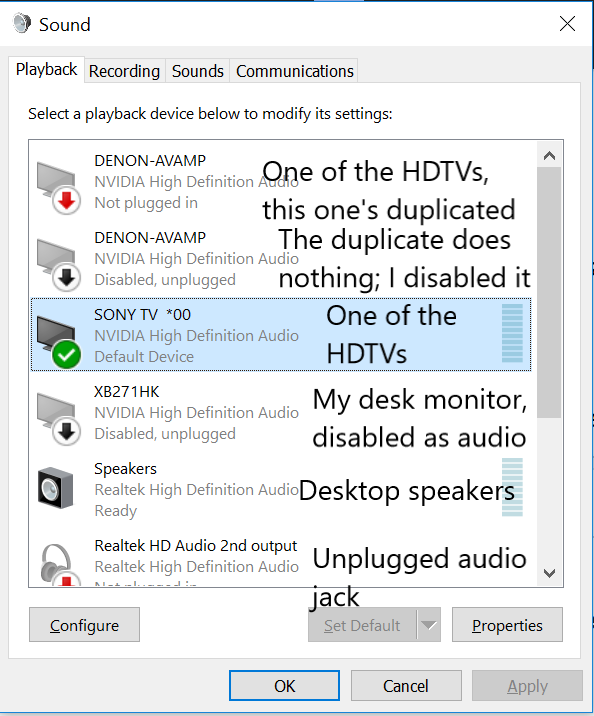 Both the HDMI HDTVs and my main DP monitor have built-in HDMI audio, however the audio on the monitor is unused (I instead use speakers connected via 3.5mm jack). If I start my computer, even if I press Win+P to use "Second Screen Only", I only have my 3.5mm jack speakers listed as audio output when clicking on the sound icon in the taskbar. Even if I open Sound settings inside the UWP ("modern") Settings app, I still don't see the NVIDIA High Definition Audio devices. This is quite strange as I've been perfectly able to use my setup like this in the past on both this and another computer. I don't know what event triggered this issue, but a full Windows reinstall is out of the question: my current install is about three months old, and so is the system. Browse other questions tagged windows-10 audio multiple-monitors hdmi control-panel or ask your own question. Is there any audio hub that works similar to an HDMI switch?